On 8 June 2004, more than half the population of the world were treated to a rare astronomical event. For over six hours, the planet Venus steadily inched its way over the surface of the Sun. This ‘transit’ of Venus was the first since 6 December 1882. On that occasion, the American astronomer Professor Simon Newcomb led a party to South Africa to observe the event. They were based at a girls’ school, where - it is alleged - the combined forces of three schoolmistresses outperformed the professionals with the accuracy of their observations. For centuries, transits of Venus have drawn explorers and astronomers alike to the four corners of the globe. And you can put it all down to the extraordinary polymath Edmond Halley. In November 1677, Halley observed a transit of the innermost planet, Mercury, from the desolate island of St Helena in the South Pacific. He realised that, from different latitudes, the passage of the planet across the Sun’s disc would appear to differ. By timing the transit from two widely-separated locations, teams of astronomers could calculate the parallax angle - the apparent difference in position of an astronomical body due to a difference in the observer’s position. Calculating this angle would allow astronomers to measure what was then the ultimate goal: the distance of the Earth from the Sun. This distance is known as the astronomical unit’ or AU. Halley was aware that the AU was one of the most fundamental of all astronomical measurements. Johannes Kepler, in the early 17th century, had shown that the distances of the planets from the Sun governed their orbital speeds, which were easily measurable. But no-one had found a way to calculate accurate distances to the planets from the Earth. The goal was to measure the AU; then, knowing the orbital speeds of all the other planets round the Sun, the scale of the Solar System would fall into place. However, Halley realised that Mercury was so far away that its parallax angle would be very difficult to determine. As Venus was closer to the Earth, its parallax angle would be larger, and Halley worked out that by using Venus it would be possible to measure the Suns distance to 1 part in 500. But there was a problem: transits of Venus, unlike those of Mercury, are rare, occurring in pairs roughly eight years apart every hundred or so years. Nevertheless, he accurately predicted that Venus would cross the face of the Sun in both 1761 and 1769 - though he didn’t survive to see either. Inspired by Halley’s suggestion of a way to pin down the scale of the Solar System, teams of British and French astronomers set out on expeditions to places as diverse as India and Siberia. But things weren’t helped by Britain and France being at war. The person who deserves most sympathy is the French astronomer Guillaume Le Gentil. He was thwarted by the fact that the British were besieging his observation site at Pondicherry in India. Fleeing on a French warship crossing the Indian Ocean, Le Gentil saw a wonderful transit - but the ship’s pitching and rolling ruled out any attempt at making accurate observations. Undaunted, he remained south of the equator, keeping himself busy by studying the islands of Mauritius and Madagascar before setting off to observe the next transit in the Philippines. Ironically after travelling nearly 50,000 kilometres, his view was clouded out at the last moment, a very dispiriting experience. While the early transit timings were as precise as instruments would allow, the measurements were dogged by the ‘black drop’ effect. 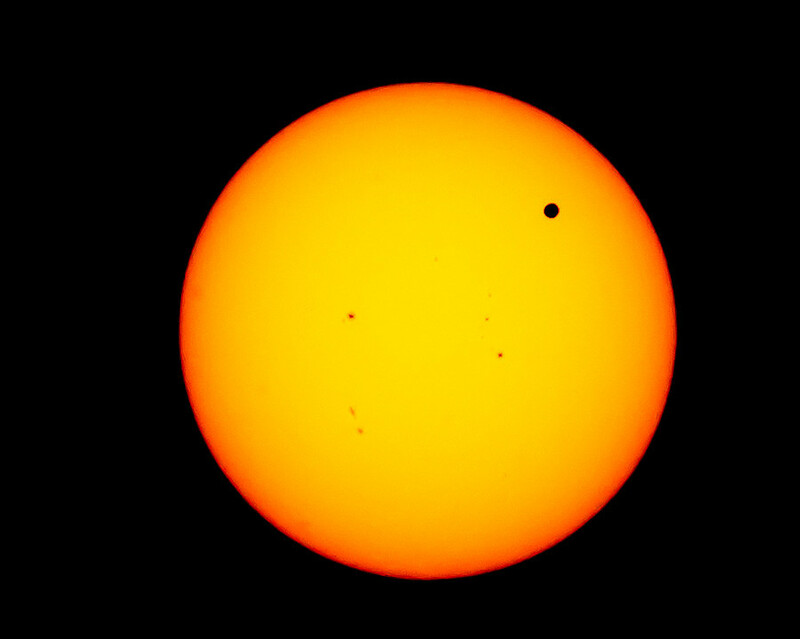 When Venus begins to cross the Sun’s disc, it looks smeared not circular - which makes it difficult to establish timings. This is due to diffraction of light. The second problem is that Venus exhibits a halo of light when it is seen just outside the Sun’s disc. While this showed astronomers that Venus was surrounded by a thick layer of gases refracting sunlight around it, both effects made it impossible to obtain accurate timings. 153,340,000 km. Reasonably accurate for the time, that is quite close to today’s value of 149,597,870 km, determined by radar, which has now superseded transits and all other methods in accuracy. The AU is a cosmic measuring rod, and the basis of how we scale the Universe today. The parallax principle can be extended to measure the distances to the stars. If we look at a star in January - when Earth is at one point in its orbit - it will seem to be in a different position from where it appears six months later. Knowing the width of Earth’s orbit, the parallax shift lets astronomers calculate the distance. Look at the following statements (Questions 5-8) and the list of people below. Write the correct letter, A, B, C or D, in boxes 5-8 on your answer sheet. 5 ABCD He calculated the distance of the Sun from the Earth based on observations of Venus with a fair degree of accuracy. 6 ABCD He understood that the distance of the Sun from the Earth could be worked out by comparing observations of a transit. 7 ABCD He realised that the time taken by a planet to go round the Sun depends on its distance from the Sun. 8 ABCD He witnessed a Venus transit but was unable to make any calculations. 9 TRUEFALSENOT GIVEN Halley observed one transit of the planet Venus. 10 TRUEFALSENOT GIVEN Le Gentil managed to observe a second Venus transit. 11 TRUEFALSENOT GIVEN The shape of Venus appears distorted when it starts to pass in front of the Sun. 12 TRUEFALSENOT GIVEN Early astronomers suspected that the atmosphere on Venus was toxic. 13 TRUEFALSENOT GIVEN The parallax principle allows astronomers to work out how far away distant stars are from the Earth.